Soft Maple, also known as Red Maple, is 25% softer than Hard Maple. It is grown in Canada and the USA. The color can be a light to dark reddish brown sometimes with a faint purplish hue or gray-green hue. 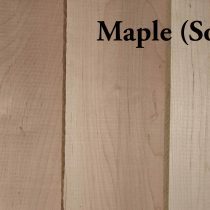 Soft Maple is used for furniture, flooring and musical instruments. Soft Maple can be difficult to glue.